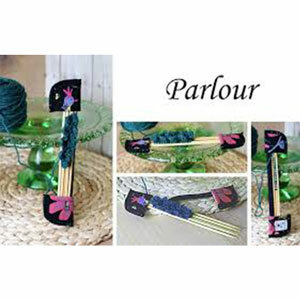 Tired of losing your work off the end of your double pointed needles? This Needle Keeper will safely hold your work on to your needles without bending your needles (if used with the proper length needles) or interfering with your project. Easy to stow in a pocket, light and washable. Two pockets on either end of an elasticized strap. Needles will not poke through pockets. Short Needle Keeper best used on 5 to 6 needles. Long Needle Keeper is best used on needles 7 or longer. Used for double point needles 7" or longer. Namaste Maker's Wallet - Teal (Loaded) and Chicken Boots DPN/Crochet Hook Case - Moondoggie are both similar accessories: needle and accessory organizers.